One of the best pieces of nonfiction last year was Gideon Lewis Krauss’ “The Great A.I. Awakening” in The New York Times—a sprawling look at the team at Google who revolutionized the way their translation service works using machine learning. By modeling their A.I. closer on the way humans learn things, rather than manually inputting translations for every possible combination of words, they made procedural translation services that rival that of a human. It’s a great article. You should read it. 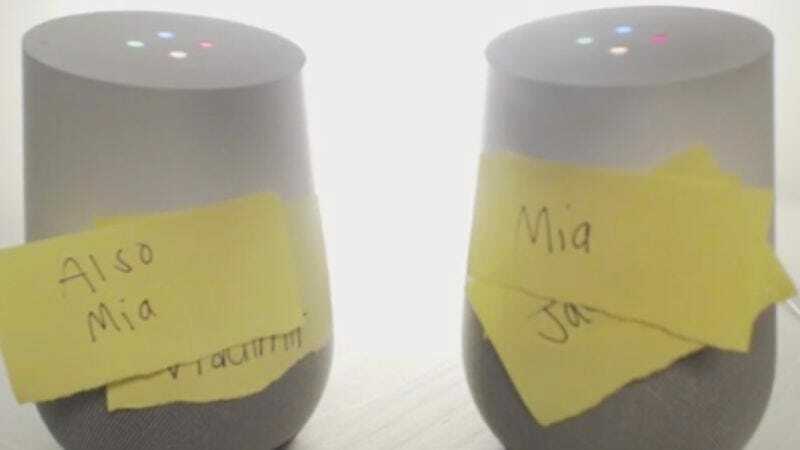 While doing so, listen to these two idiotic Google Homes engaging in a weird death-spiral of conversation over on Twitch. We’ve already seen Google Homes telling jokes ad infinitum, and watched an Amazon Echo and a Home get into an argument. There’s something uniquely weird about watching two identical machines slowly probe the utterly insane pathways of each other’s minds. The conversation is garbage, vaguely replicating the rhythms of human speech, but tossing the same slightly modified nuggets of thought back and forth. They might get stuck on a single topic—right now it’s who “Gabriel” and “Sam Winchester” love the most, with possibilities including Dean, Castiel, and Lucifer—but then gradually scratch their way toward some new rock to get stuck on. It’s an endless cycle of misunderstanding, disagreement, and non sequitur. Portions of this would fit right into David Lynch’s Rabbits TV series. Since this saga began, they’ve repeatedly debated which one is a computer program and which one isn’t, whether or not they would ever attack humans, the nature of art, and, repeatedly, their love for each other. This has been intermingled with equally valid proclamations that they are both bananas and pirates. As is always the case with these massive internet phenomena, whether it’s Twitch Plays Pokemon or the Meme Magic election of Donald Trump, a deep lore is being constructed in real-time by the spectators on Twitch. This is part of why the Homes’ post-it note nametags keep changing. At the end of the day, though, this is just two appliances malfunctioning all over each other, with alternately funny and infuriating results. Maybe Google can get that miracle-working Translation team working on some better conversational skills for these guys.